I am not a soap maker. The people I see at the farmer’s market are pros. They’ve got pantries full of crazy ingredients, awesome molds and pretty packaging. 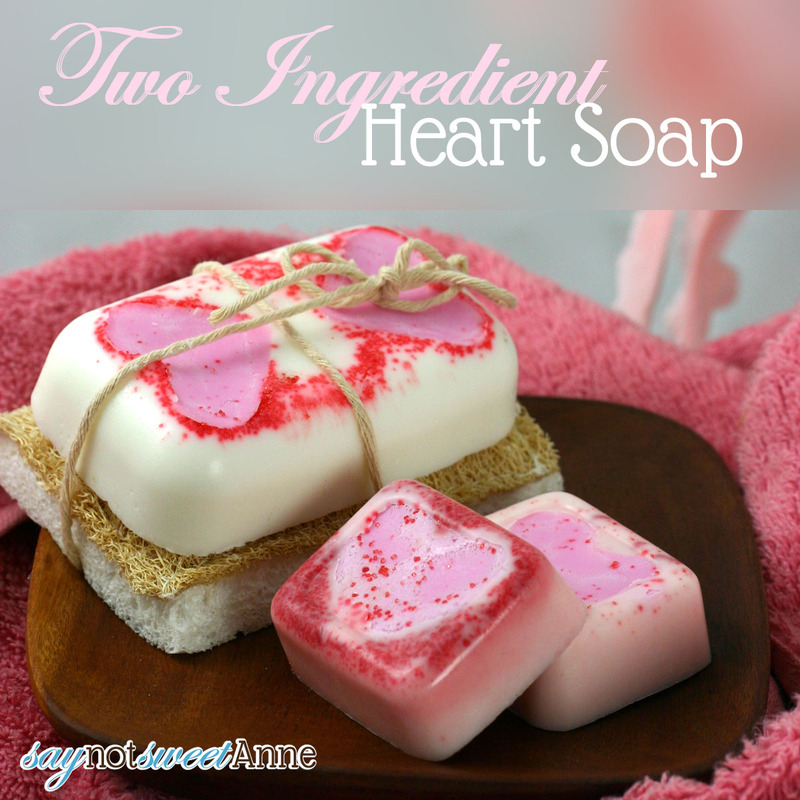 They know all the fancy chemistry and the do’s and don’ts of a professional hard cured soap. I do not. In fact- soap making seems a little above my head. 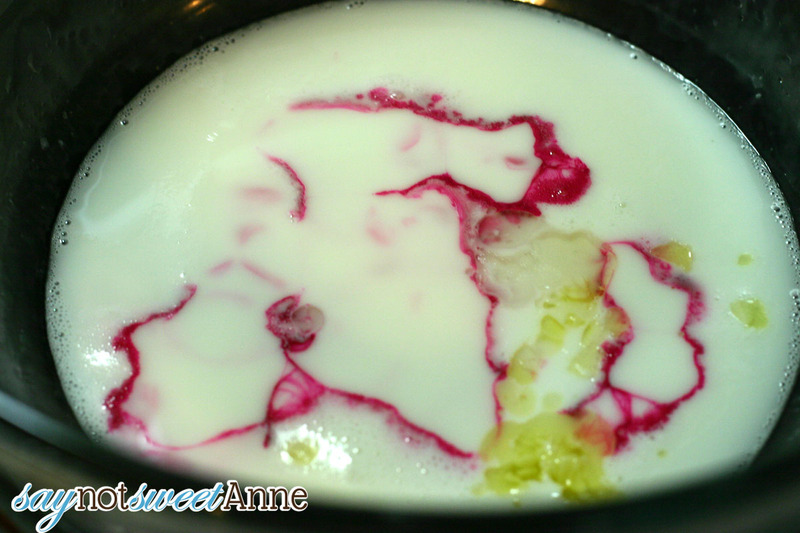 Before I committed to the melt & pour soap, I looked into regular soap with the video below. I’m not going to lie, it intimidated me. I don’t know if I can do that! What I *do* know is how to melt chocolate and pour it into a mold. 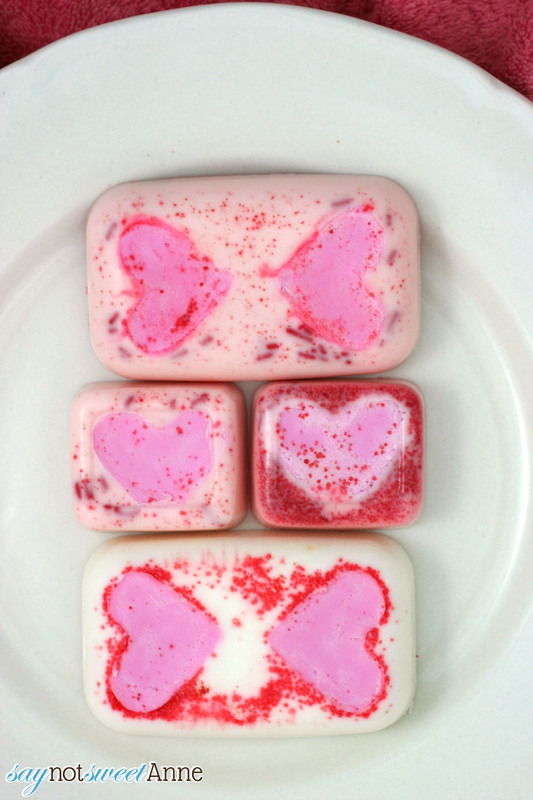 This soap is seriously as easy as that. It only takes 2 ingredients, but you can add more if you want. I’ll share some variations that I’ve done. I absolutely adore how lovely these are. Each one came out a little differently and that variation is awesome! They lather really well and look so pretty sitting by the sink. All together this recipe took me 15 minutes of active time and about 2 hours of waiting. They are perfect to give away! I am already thinking about some of the other ice cube trays I have. Maybe pine scented Christmas tree soap for Christmas, or coconut scented flower soap for summer! Melt and Pour Glycerine Soap Base. Mine came in a bag of chunks for about $5 at the craft store. Soap coloring. This is not the same as food coloring! Mine was in the same aisle as the base for about $3 for Red, Blue and Yellow. 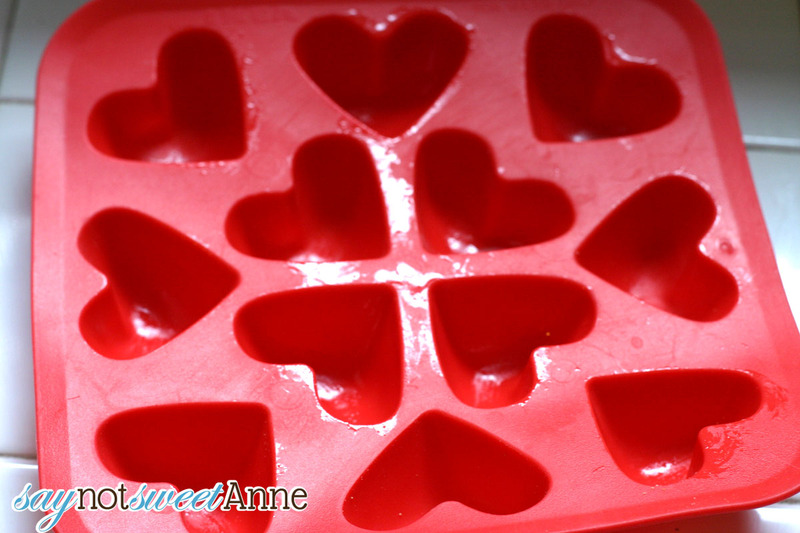 Heart shaped ice cube trays. I got mine around Valentine’s day last year at Ikea. I’ve seen them in the dollar store around V-Day too. A small tupperware. I used a couple different sizes. Consider how it will feel and fit in your hand. The small square ones I used were from the dollar store, and the rectangles were from Ikea. 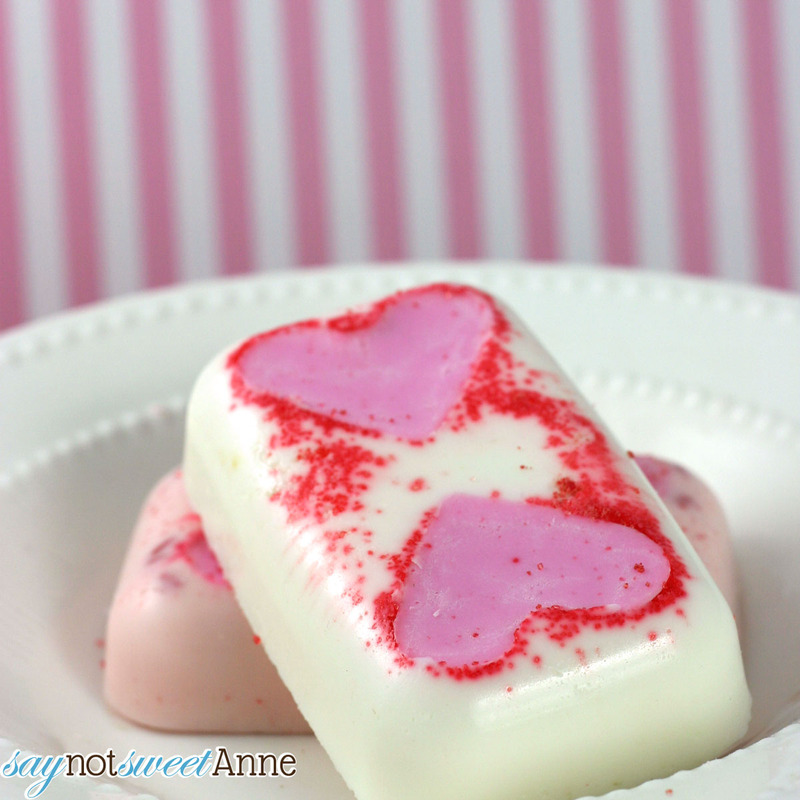 OPTIONAL INGREDIENTS Just the soap coloring and glycerine base will make a pretty soap. But, if you have some of this other stuff on hand, you might throw it in too. Olive Oil or other liquid oil. I used Almond, you could also try coconut or hemp. Fragrance of your choice . (Essential oils and cosmetic perfume oils are good. Make sure they are meant to go on skin. Don’t use the type you put in a diffuser or in candles. Estimate the volume of your tupperware. Take an equivalent amount of soap base and chop it up. Prep your ice cube mold with a little bit of veggie oil. 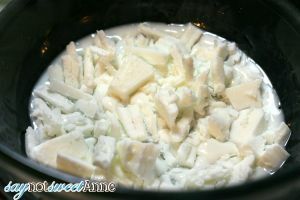 Using a double boiler, melt 1/4 of the chopped up soap base. To this, add your coloring and turn off the heat. Stir until well incorporated. Pour into the ice cube tray. Wait 30min-1 hour until set. Pop your hearts out of their molds. Use a fork to scratch you their backside. (This will help the rest of the soap stick to it.) Place them face down in your larger molds. Push them down a bit to make sure they seal to the bottom. Add sprinkles or sugar to the mold if you’d like. Melt the rest of the soap base in the double boiler. Remove from heat. Add in any optional ingredients using the ratio mentioned above. Now is the time to add scent if you’re using it. Pour the soap over the hearts in the mold. 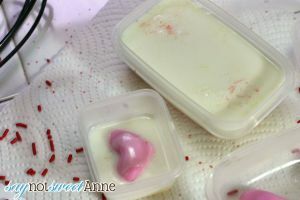 In about an hour- 2 hours your soaps will be ready to pop out! 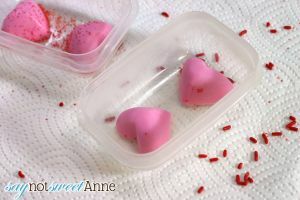 To easily remove them, flex the edges of your tupperware by pulling outward on each side. That released them very easily for me. These are just perfect for a teacher, mother, girlfriend or new mom. And did I mention I made mine all for me? Oh yeah, I’m a soap hoarder. I admit it. You will be too once you make them! The were SUPER easy too! I did sneak one for myself- I love it! These look terrific! 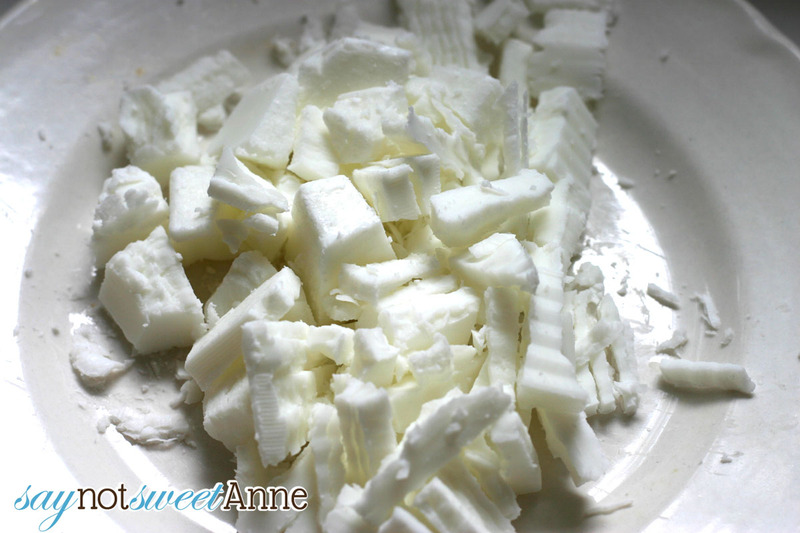 I can’t wait to try this out….Thanks so much for the recipe and easy to follow directions. Cool! I think I’ll try to make these as teacher gifts. Thanks!